Organisers of the new Edinburgh's winter season have announced a programme of free events in the capital to celebrate St Andrew's Day. Scottish performers will take part throughout the afternoon and evening of Saturday 30 November in Edinburgh's Grassmarket. Breabach, Dougie MacLean, Louis Abbott and Blazin' Fiddles will all feature at the event. There will also be ceilidh events and workshops. Children can join dance workshops, write their own ceilidh tune, or hear some Scottish stories of myth and magic by the Scottish Storytelling Centre. 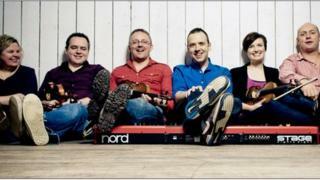 There will be an outdoor ceilidh with the Cask Strength Ceilidh Band and the Adam Sutherland Band. There will also be a record-breaking attempt of a giant Strip the Willow as well as a Silent Ceilidh. The programme runs from 14:00 to 22.00 and all events are free. Culture secretary Fiona Hyslop said: "Scotland's winter festivals bring people together to celebrate the very best of our culture, creativity and hospitality. "Not only do they make a significant contribution to our economy, but they bring warmth, excitement and sparkle to our cold, dark winter nights, and demonstrate our ability to celebrate our rich culture year-round. "The packed programme of free events around St Andrew's Day in Edinburgh's Grassmarket is the perfect way for the city to kick off the celebrations." Pete Irvine, the director of Unique Events, said: "It's the first time that we have celebrated St Andrew's Day in this way in Edinburgh, and a great start to the city's Christmas and Hogmanay programme of events, all part of Scotland's Winter Festivals." Underbelly director Charlie Wood said: "We are delighted that the St Andrew's Day celebrations are part of our, and Unique's, inaugural Edinburgh's Christmas programme offering the finest seasonal entertainment for the family."